Rovio announces Angry Birds AR: Isle of Pigs augmented reality (AR) game for iOS. 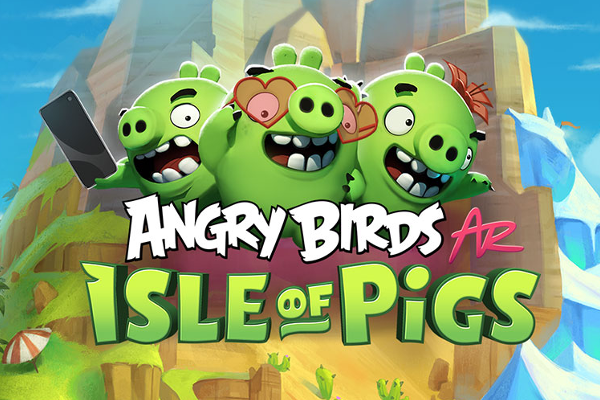 Today at the Game Developers Conference (GDC) in San Francisco, Rovio Entertainment and Resolution Games have revealed details of their upcoming mobile augmented reality (AR) game, Angry Birds AR: Isle of Pigs. The new game allows players to take the power of the Angry Birds slingshot into their hands like never before, placing the classic piggy constructed towers into the player's own environment using Apple's ARKit technology. Initially launching with at least 40 levels of gameplay, fans of the Angry Birds series of games will get a one-of-a-kind view into different locales of Piggy Island, toppling towers and popping pigs in the classic satisfying gameplay they have come to love. Employing the unique elements of Apple's ARKit, Angry Birds AR: Isle of Pigs allows players to overlay Angry Birds levels onto their own surroundings. Viewing the 3D levels through an iPhone or iPad, players can walk 360-degrees around levels to find weaknesses and hidden items, and when they are ready, line up the perfect shot with intuitive onscreen controls. Of course, the classic Angry Birds characters are there to help defeat the Birds' green nemeses. Angry Birds AR: Isle of Pigs, coming to iPhones and iPads with ARKit support in late spring, is available for pre-order today.